As you can probably tell by the page dedicated to her, I have a mild obsession with my puppy, Rylee. I can’t help it, I’ve always wanted a dog and she wonderful – total sweetie – her favorite things in the whole world are children and carrots! Once she is a year old, we want to see if she can pass the test to be a children’s hospital visitation dog. 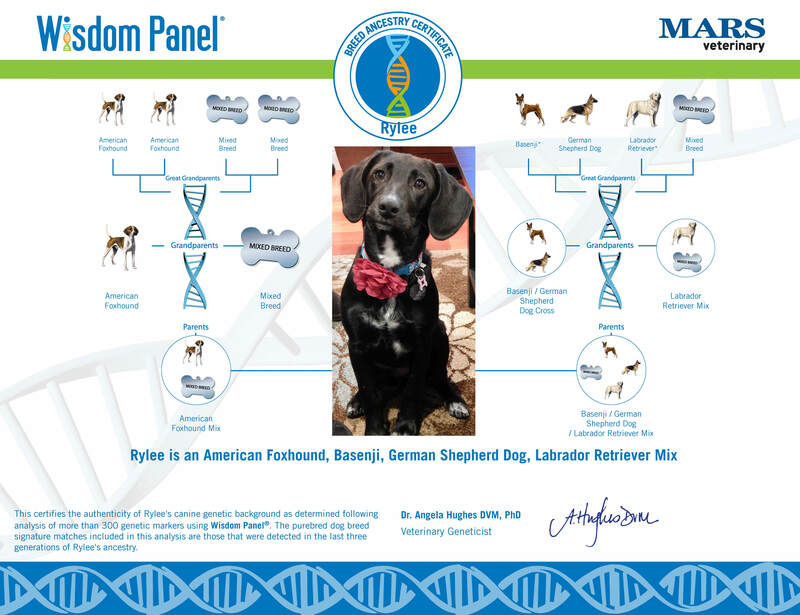 Before we adopted her, I took a few “which dog breed is right for you” quizzes and the answers kept popping up Beagle or Lab. I figured we’d strike a perfect match if we could find one that was a beagle lab mix (beagledor? ), so off to PetFinder.com I went. I soon stumbled on the Road Trip Rescues page listing several for 8-week old beagle lab puppies. Perfect! After our application was approved, we met the foster family and instantly fell for Rylee. As she got a little bit bigger, we thought she looked a bit tall and slender for a beagle so we decided to do a DNA test. It could have come back that she was part giraffe and part Tasmanian devil and it would’t have changed how we much we loved her. We just wanted to know to satisfy our curiosity and to help get a little insight into what make her tick. From the test, we learned that since she is a scent hound and needs some “nose work” to keep her mind busy from time to time. It also explained why she doesn’t bark but make sounds somewhere in between a howl and a yodel. A lot of people at the dog park ask me about what breed she and then about the NDA test process when I explain what she is. It was so simple! We went to Wisdom Panel’s website and ordered a test kit online. They are $80 now, but we got ours for $60 or $65 because I was able to find a coupon code online. I think our vet might have given us coupons for some other brands as well but Wisdom Panel had the best reviews online so we went with that one. The kit came in the mail and we just had to rub 2 giant q-tips on the inside of her cheek to get some drool, pop it back in the box with some labels, and wait a few days for an email with the results. It was really fast! The site said it would be 3 weeks but I think it was 10 days total. And the results…. (click the link for more details from the full report).